We’re a group of upwards of 100 folks in the Portland area who have roots or are interested in Tuscany and, more generally, Italy. We meet about four times per year to visit, eat and learn about Tuscany and Italy … sometimes all at the same meeting! Whether you’re of Tuscan descent or not, we encourage you to join our club and learn about the land of our forebears. We’re part of a network of Tuscan Associations worldwide, known collectively as Toscani del Mundo, whose membership numbers 10,000 spread among 110 clubs around North America and the world. Please click on the links above to learn more about our local Association. The Links page itself can connect you to some of the other Tuscan organizations around the globe. 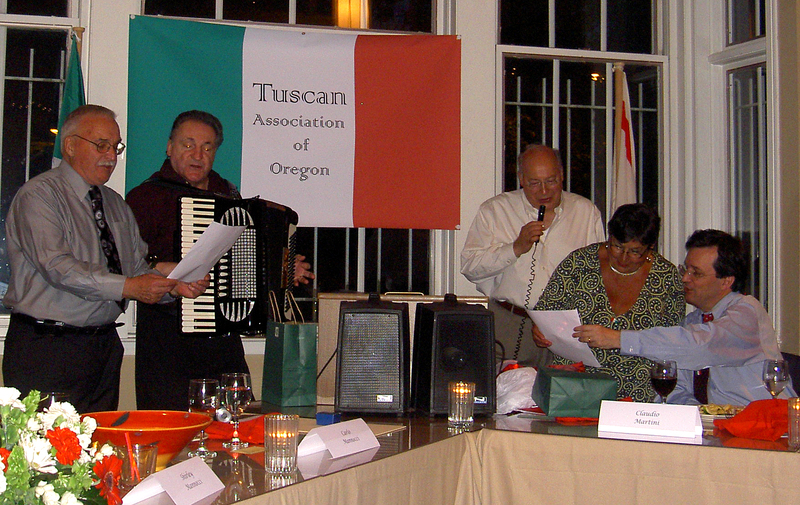 The Tuscan Association of Oregon was founded in 1996 by our “founding padre” Carlo Mannocci and a band of other dedicated Tuscans and Italians. We’re one of several Italian groups which help continue the tradition of Portland’s Little Italy — the area south of downtown which flourished in the early-to-mid 20th Century.